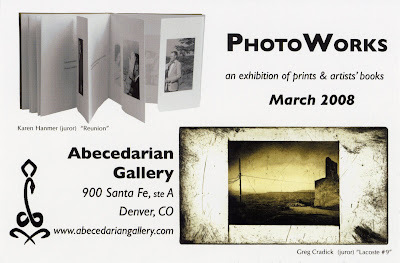 Two of my books were chosen for the National Juried Show - PhotoWorks which is taking place at the Abecedarian Gallery in Denver during the month of March. 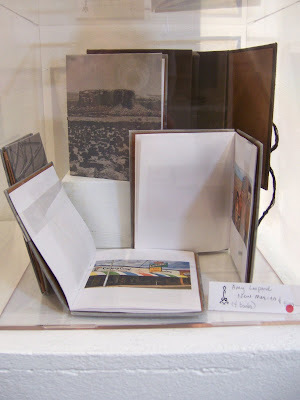 New Mexico and Unknown Ancestry were included in this exhibit of Artists' Books and Prints. The exhibit was co-juried by printmaker/photographer Greg Cradick (Denver, CO) and photographer/book artist Karen Hanmer (Chicago, IL) (http://www.karenhanmer.com/). 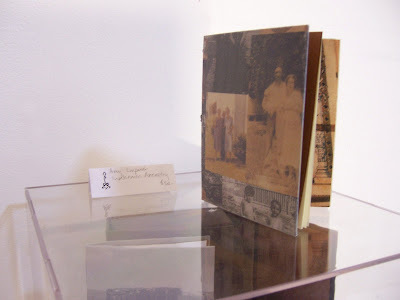 I had the opportunity to spend the weekend in Colorado to attend the opening reception and lecture on Contemporary Trends in Artists' Books by Bill & Vickie Stewart. I met lots of interesting and charming people. A few of the people that I really enjoyed meeting and spending time with were Alicia Bailey, gallery owner and book artist (http://www.aliciabailey.com/), Amy Soverow, glass artist and book artist (http://www.soverowglass.com/) and Bill & Vicky Stewart of Vamp & Tramp Booksellers (http://www.vampandtramp.com/html/home.html). New Mexico, a one-of-a-kind book, was purchased by Colorado College in Colorado Springs. Unknown Ancestry is an image driven narrative about family history. This hardcover book tells the story of a family mystery through antique photographs and text as image. The only text that appears in the book is in the form of original documents from the late 1800s through the mid 1900s and personal correspondence from the early 1900s up until a month before the book was constructed in March of 2007. The book begins with a photograph from the 1880s of the couple who give life to our story, Robert Charles LeePard and Carrie Liz Carle. Through letters, pages of a family Bible, Western Union telegrams and many other documents, the pieces of a puzzle are put together. In a family’s attempt to uncover their roots which are buried beneath a runaway orphan, this family history memory book shares marriages, births, deaths and resurrections as the LeePard descendants dig up answers to their questions. The book ends with a collage of excerpts from e-mails between two women who have never met but are united by their search. The book carries the reader on a 150 year journey beginning with the birth of Robert Charles LeePard on Christmas day in 1857 to unknown parents in an unknown place. In 2007, his descendants collaborate to solve the mystery of their unknown ancestry. Edition of 25.